Father Greg Lockwood is unlike any Catholic priest you have ever met—a man who lounges in boxer shorts, loves action movies, and whose constant jamming on the guitar reverberates "like a whole band dying in a plane crash in 1972." His daughter is an irreverent poet who long ago left the Church's country. When an unexpected crisis leads her and her husband to move back into her parents' rectory, their two worlds collide. 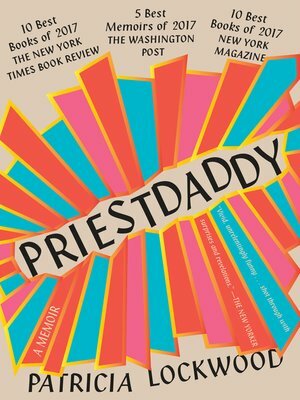 In Priestdaddy, Lockwood interweaves emblematic moments from her childhood and adolescence—from an ill-fated family hunting trip and an abortion clinic sit-in where her father was arrested to her involvement in a cultlike Catholic youth group—with scenes that chronicle the eight-month adventure she and her husband had in her parents' household after a decade of living on their own. Lockwood details her education of a seminarian who is also living at the rectory, tries to explain Catholicism to her husband, who is mystified by its bloodthirstiness and arcane laws, and encounters a mysterious substance on a hotel bed with her mother.